At a party our first year in Addis I met a British man named Guy who told me about an upscale eco-lodge he was building in Bale Mountain National Park (pronounced with two syllables BAH-lay, not like a bale of hay). At that time Guy hoped the lodge would be ready in about six months. but there were all sorts of obstacles that delayed progress. I kept an eye on the website, though, and finally last year I saw that Bale Mountain Lodge was open for business. This is my last year in Ethiopia. The Bale mountain park has been pretty high on my list of places to see before I move on, and the four-day Ethiopian New Year holiday in September seemed like the perfect time to make the trip. I booked us in to the lodge for the weekend. 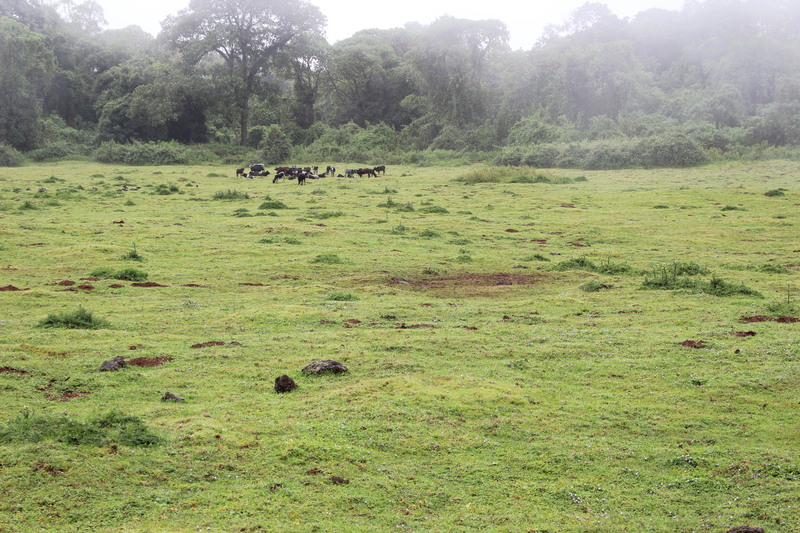 The park is about 400 km southeast of Addis. Road conditions are such that it took pretty much all day to get there by car. But Ethiopian Airlines is opening a new route to the nearby town of Goba, so if you should decide to go you can now fly part of the way and cut the driving time down to a couple of hours. However you would miss a lot of good scenery if you did that. Our first morning we explored the area around the lodge on foot. In the afternoon Guy took a group of us to see “the hydro.” One of the many features that makes this an eco-lodge is the micro-power plant that uses stream water to provide all the electricity for the property. It is a micro-marvel of civil engineering. Guy’s next project for the lodge is to build a sauna at the edge of this natural waterfall pool. James, the resident naturalist at the lodge, is an expert on the local flora and fauna. 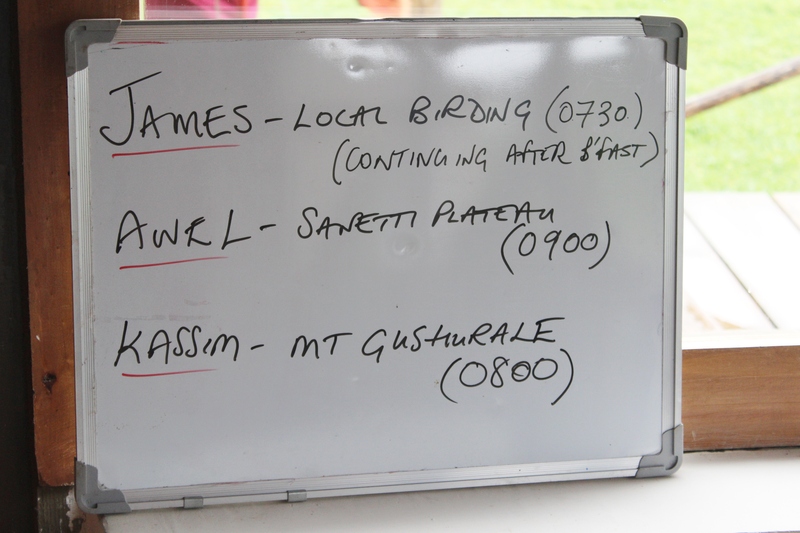 He runs a bird-banding (For British English speakers, that’s bird-ringing) program at the lodge. When there are children visiting, he lets them help. There are plenty of other possible activities that we didn’t have time for in our weekend, including climbing the impressive mountain that dominates the view from the lodge’s windows; visiting a local village; and bird walks. That reddish splotch in the middle is where the horse used to be. After the lions came the hyenas and the vultures. On our last night at the lodge the lions made a reappearance; too far away to take a photo in the evening light, but I can say I saw them. 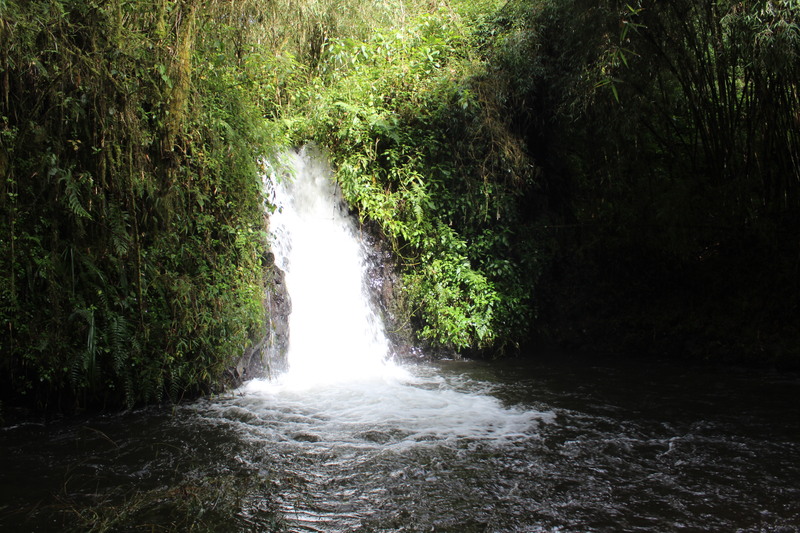 This entry was posted in Animals, Around Ethiopia, Ethiopia and tagged Bale mountains, Bale National Park. Bookmark the permalink.